As tens of thousands of tourists and residents packed up, boarded up, and "got out of Dodge" on Thursday, a few are choosing to ride out the storm on the Outer Banks as Hurricane Earl approaches. NBC's Ron Mott reports from Kill Devil Hills, N.C.
BRIAN WILLIAMS, anchor: in with our corespondents along the Eastern Seaboard . You heard mention eastern Long Island 's going to get clipped. NBC 's Peter Alexander is there. Michelle Franzen on Cape Cod , also in the cone of this. And Ron Mott also in Kill Devil Hills . Ron , good evening. RON MOTT reporting: Brian , good evening to you. Today was moving day here on the outer banks. This small motel behind me was filled with guests just yesterday. Tonight it sits empty and quiet. And of course, in just a few hours, it's about to get real noisy out here. Getting ready for a rude awakening in North Carolina . Mr. DERWOOD SMITH: Now, does it have the oil in it and everything, too? Unidentified Man #1: The oil is in it, yes, sir. MOTT: Coastal residents like Sherry and Derwood Smith geared up for what Earl could leave behind come morning. Unidentified Man #2: Good luck, guys. MOTT: Generators, gas cans, jumper cables and other emergency supplies were carted off in bulk just hours before Earl storms in. Mr. SMITH: Before we'll go, it'll have to be a direct hit. We'll stay for the -- all the other stuff. Unidentified Man #3: Do you want to hand me the other one? Unidentified Man #4: Be safe. Good luck to you. Unidentified Man #5: I'm worried about the boat. It's my livelihood. MOTT: ...sending many businesses headed for a slow holiday weekend. Mr. DOUG RAY (Paradise Fun Park): Everybody's a little disappointed, including us. It's -- our season will be over here in very short time anyway, so, you know, we'd like to take advantage of that. But, you know, safety first. Mr. MATT LAWRENCE (Richmond, Virginia Tourist): They've asked us to leave, so we're going to have to cut our vacation short this year. MOTT: Further north on the mid- Atlantic coast , from Virginia to Delaware , it seems beach vacations continue uninterrupted. For now, at least, surf's up in Ocean City , Maryland . Mr. SHAWN ESHAM (Ocean City, Maryland Resident): It's been a long time since Ocean City has had a really bad hurricane, and I'm afraid that, you know, we're a mite -- kind of overdue. 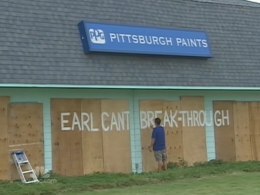 MOTT: Back in North Carolina , locals are challenging Earl to see just how bad a hurricane he will be. Ron Mott, NBC News, Kill Devil Hills , North Carolina .